Provides lasting, effective tissue support in the treatment of strains and sprains, soft tissue injuries, joint effusions, general edema, post- burn scarring and ribcage injuries. Also utilized for pressure dressings and arm fixation. 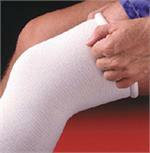 Allows for freedom of movement for the patient. Once the bandage has been applied, covered elastic threads within the fabric move to adjust to the contours of the body and distribute support evenly over the surface.